Oct 20 "Are you related?" Noémie Merleau-Ponty, October '17 - available to download as a PDF. When I read these sentences, my heart bumped out of my chest with emotion and relief. A woman, a writer, a social scientist, had used such insightful words to describe the same psychological symptom I struggled with for quite a long time in my childhood and early adulthood: even if I never struggled with insomnia I experienced intensely this feeling of emptiness, infinite nothingness, which just takes a bite out of your self and leaves you with the authoritative empire of silence to start your day with. I have been wanting to write this post for a long time, hesitating, raising will and silencing it, discussing it with persons of trust, not knowing what I was able (allowed?) to voice. 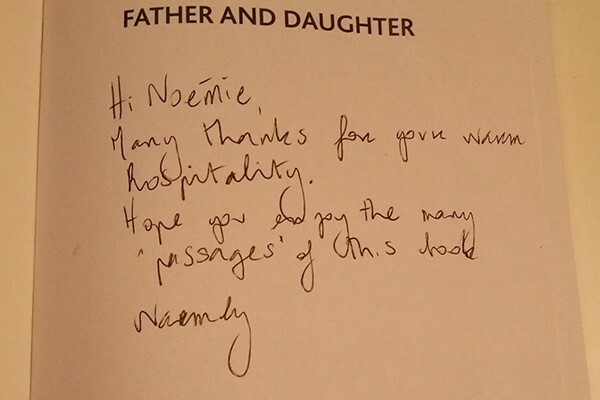 I was recently gifted Father and Daughter by a dear colleague as a thank you because I opened my house and hosted her for a beautiful evening and a restful night, I hope. And it gives me power: this book as a gift for my hospitality. So, yeah, I am writing this post, and I am scared, and I am thrilled at the same time. Well, overall, this is a pretty classical feminist story, but it took me a damn long time to be able to write about it. Voicing, even the expected (feminist critique) of the expected (patriarchy), can feel quite liberating. This question has always been very peculiar to me. It certainly always made me feel uncomfortable, because of its recurrence, because I do not feel related and because I almost always answered yes. I received a name that is indeed the same as someone else who is related through the traditional European version of kinship as a genealogical tree and who happens to be quite famous in certain intellectual circles. I never met him. He died long before I was born. Never had the chance of making a kinship relation, of “kinning” as Signe Howell would say[i]. I owe my day to day education and care to my single mother who comes from a family that put a lot of effort into leaving the poverty of underpaid working class behind and find higher education ahead. When my sister and I were young, due to happy circumstances in a harsh period, she got a flat from a good friend in a posh neighborhood of Paris. We could be registered in a state school where pupils receive the bourgeois education of elitist areas of the capital city. When times were better, she decided to stay there. In this rich environment, I was trained to think with the several techniques of the French Republican School. I worked out of exhaustion to be where I am today. My body knows. Like numerous of my fellow coworkers, I have very poor eyesight and I suffer chronic back and neck pain. All these reasons make me quite uncomfortable when somebody assumes that I had it all, based on my name. But, most of the time, I answered yes to that question…I did not feel empowered enough to contradict their assumptions of social reproduction based on genealogy. Politeness can be a mean of reproduction, silencing individual and discordant voices in a way that is praised and valued. Smart mean. I wonder, those who are curious about my name and its relatedness, what are they looking for? What do they project? Which version of kinship and reproduction? It is like there is something magical about famous last names, as if they were proof of inheritance by themselves, as if they did not need histories and personal biographies. Like biology, as Sarah Franklin said in a workshop, they can be an “impediment to thought”. They can be an easy medium of a self-evident story of predictable determinism that is a conservative and patriarchal version of social reproduction. My abilities are in my name, which was given to me through a successful lineage of males, and knowing me is a way to access their talent and success. “I really admire his work”. I do not exist, nothing exists, nothing at all, apart this strong power of patriarchal scriptures writing the world and the walls of some houses. In a way, I am so, so lucky that I was not born a boy. It would have been even more difficult to escape this particular version of social reproduction. I would have fitted perfectly. First born and a boy. In a way, it is so much the better that I was born a girl! As a boy, it would have been much more difficult to tell another story because I would have been more easily legitimized and that might feel comfortable enough to silence dissonance. Actually, I do not know, and I am very happy I do not have to know that position of masculinity. At least, being a girl, I could experience processes of delegitimation which are good pushes for rebellion. You are “smart…for a girl” as I was told when I finished high school. Well, let’s see how far I can go. Oh! ReproSoc! Yes indeed within a deterministic version of reproduction, I am related. He was my grandfather’s cousin, and I grew up with a public name that has a history which precedes me. I will not deny that, nor the fact that I was certainly influenced by my paternal family’s intellectual background when I spent time with my relatives on weekends and during holidays, nor the fact that I choose to keep my father's name, nor, that, most probably, I benefited from class privileges. But I choose to keep this name not as a tool to reproduce that version, but because I claim it, because it is mine, because I do not see why one version of Merleau-Ponty should be the only one to be a signature. And indeed, some other MP in my family signed with this name too, and they also had to answer, all the time, to their genealogy. Enough. Maurice certainly made this name famous for his hard intellectual work, but that does not signify that names are in themselves and for themselves authoritatively single authored or that carrying a similar name enacts some kind of deterministic inheritance. Well, it depends on the version of kinship and social reproduction you want to talk about and how you want to talk about it. I do not think stars are gods and I believe in the witty, curious reinvention of life. My name is not just an inscription. My name is not the reproduction of a capacity to write and think, but it bears the survival that writing allows. Against silence, even if sometimes, it is okay to have nothing more to say. Against politeness, it is alive. There is something for me. My house is open. And, by the way, who chose this cover for Ann Oakley’s book? Father at the top, really? Ha ha. A generous laugh for a good night of sleep. [i] Howell, Signe. 2006. Kinning of foreigners: transnational adoption in a global perspective. New York, USA: Berghahn Books. Oct 27 Do you see what I see?